This month our book cart is featuring several biographies of Christian leaders from the past. They are written for an audience of young readers, especially those in the early elementary grades. However, even the older children will enjoy reading them, and it might even give you a sample taste that will spark a desire for reading more detailed biographies. Included in this series are the biographies of Augustine, John Owen, John Knox, John Calvin, Lady Jane Grey, and others. These books will help you become more familiar with some important characters in the history of the church that we often hear teachers and preachers mention. You’ll know why they are mentioned when you read about the experiences they had in being faithful to the gospel. 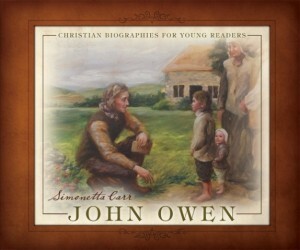 These biographies will give you some great opportunities to discuss not only the exemplary lives of these individuals, but also important Bible truths that children need to know. 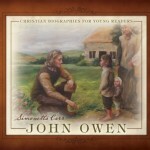 For example, in the John Owen book, it includes a catechism which he used when visiting families in his church. This last point brings out the former school teacher in me. Children need to gain a love for reading. It is something that they will be doing their entire lives. Exposing them to quality reading material like these biographies will point them in the right direction and prepare them for other quality reading experiences. Then there is reading comprehension. Stopping to ask questions and evaluate situations are excellent ways to help in this area. Getting children to put themselves in a similar contemporary situation will make them think. These books will definitely help to improve their reading skills. All of these points make Biographies for Young Readers series an excellent summer reading program. They can be included as part of family worship, and the books will be valuable for rereading, which children love to do! Take advantage of these books. Get as many of them as you can, and get started this week. School is out for the summer, but that doesn’t mean it’s time to shut down the learning opportunities.